Just what does an engineer look like? Many of you may picture an image of the female version of Steve Urkel. But, we know that is far from the truth. Women engineers are not nerdy, dorky ladies who have no life; they are strong female characters similar to the ones we read in comic books, such as wonder woman or superwoman. To change this way of thinking, the viral #ILookLikeAnEngineer campaign emerged on social media to combat bias and sexism. This shows the world the diversity of women that work to improve our world in the fields of science and technology. This hashtag was created by Isis Winger, a 22-year old engineer at OneLogin, a technology company. 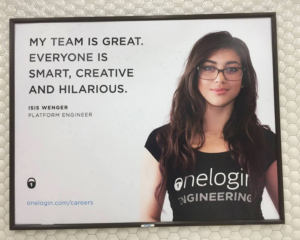 Her photo was taken for the company’s recruiting campaign, which was featured on a poster on the Bay Area Rapid Transit. Soon, comments flooded in and she was attacked on social media for not fitting the mold of what an engineer “should” look like. The result was a trending hashtag of “iLookLikeanEngineer.” It took off. What initially started out as sexist responses to an advertisement featuring a female engineer quickly turned into an opportunity to highlight the contributions of women in the technology, engineering, and science industries. My parents are both engineers. My dad and I have always acknowledged how proud we are of my mother, who is a successful software engineer. Therefore, growing up, I always understood that science and engineering skills are not male qualities. Despite the fact that a report by the Congressional Joint Economic Committee estimates that nationwide about 14 percent of engineers in the work force are women. This movement not only will improve this low percentage but will also allow other young men and women (who did not grow up with a female engineer as a role model) to put a face to an engineer. I especially admire the hashtag because it allows female engineers to come forward and show young women that there are people just like them working in these fields and advancing their careers. My friends and I had a lot of fun scrolling through twitter to see the incredibly diverse images of women engineers (from Snapchat, The White Office of Science and Technology, and NASA). Afterwards, many of my friends abandoned their silly fear of joining STEM. Now, we dream of becoming a part of that community.